Tribhuvan International Airport (TIA) witnessed robust passenger and aircraft traffic growth in the first nine months of 2017 despite infrastructure bottlenecks.According to TIA data, 2.74 million travellers passed through the country’s only international airport as of the third quarter of 2017, up 9.59 percent year-on-year. Aircraft movement also grew by a robust 27.54 percent to 24,249 flights, a solid increase primarily due to Chinese and Indian carriers increasing flight frequencies to Nepal. Currently 29 foreign airlines and three Nepali carriers connect Kathmandu with international destinations. Chinese carriers Air China, China Eastern, China Southern and Sichuan Air saw their passenger carriage soar 120.55 percent during the period January-September as Chinese arrivals continued to grow in Nepal. These airlines flew 231,730 travellers. Last August, another Chinese airline, Lhasa-based Tibet Airlines, commenced direct flight service on the Chengdu-Kathmandu-Chengdu sector. Meanwhile, passenger carriage by Indian carriers Jet Airways, Indian Airlines and Indigo Airlines jumped 19.14 percent in the first nine months of 2017. These three carriers flew 542,051 passengers. The Indian carriers command a 19.72 percent international passenger market share in Nepal. A breakdown by airlines shows that India’s Jet Airways topped the list of carriers with the highest number of passengers. Jet, which operates three flights to Delhi and two flights to Mumbai daily, flew 347,042 passengers in the first nine months of this year, recording a 48.46 percent jump. Nepal Airlines came second with a passenger carriage growth of 2.23 percent. It flew 281857 passengers during the review period. The growth rate of Nepal Airlines dropped after it sold one of its two ageing Boeing 757s, bringing down its international fleet to three aircraft. Low-cost carriers Fly Dubai and Air Arabia stood third and fourth despite a drop in passenger growth. Air Arabia flew 217,516 passengers, down 13.95 percent, while Fly Dubai’s passenger numbers dropped 3.91 percent to 218,847, according to TIA statistics. Doha-based Qatar Airways, that had been the top passenger carrier in Nepal for many years, slipped to the fifth spot with a sharp 16.62 percent drop in passenger carriage. It flew 215,842 passengers in the first nine months of 2017. TIA statistics show that Oman Air’s passenger numbers dropped 2.94 percent to 130,952 individuals. Meanwhile, Thai Airways saw its passenger numbers grow by 3.31 percent to 126,548 individuals. Indian national flag carrier Indian Airlines saw a sharp decline in passenger numbers in the first nine months of 2017. It flew 112,117 passengers, down 16.80 percent. Malaysian-based low-cost airline Malindo Air saw the strongest passenger occupancy recording a 111.16 percent growth. It flew 109,432 passengers in the review period. Another low-cost carrier from Malaysia, Air Asia, saw its passenger numbers drop a whopping 44.74 percent to 69,423 individuals. Abu Dhabi-based Etihad Airways flew 91,445 travellers in the first nine months of 2017, down 10.82 percent. Nepali carrier Himalaya Airlines, which launched direct flights to Doha, Qatar in May last year, carried 88,783 passengers in the first nine months of this year. Despite infrastructure bottlenecks at the country’s sole international airport, it saw aircraft movement jump 27.54 percent. The Nepali skies recorded 90 international flight movements daily on average. 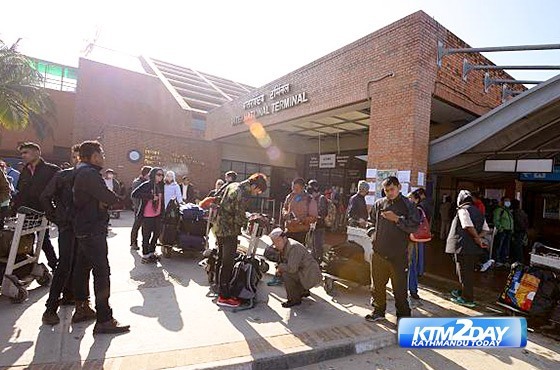 According to the Civil Aviation Authority of Nepal, it has initiated the process of developing new parking bays and expanding the international terminal building to enhance facilities and safety standards at TIA.